I have a kitchen sink and I’m not afraid to use it! Ok, so, I use my sink every day, but that doesn’t mean I actually eat it! But since my concoction kind of seemed to contain nearly every veggie in my fridge, why not call it what it is, right? I love my veggies! In fact, I have no idea what has happened to me, but as I’ve grown up, and become a grown up, my tastes have changed quite a lot. I love steamed broccoli. Straight. No chaser. Steamed asparagus. A tiny bit of butter. Grilled vegetables, raw vegetables. Red peppers, green peppers, yellow peppers. Even jalapenos on occasion if they’re in something like salsa and have been seeded. Can’t take too much heat. I even like trying new ones that are kind of off the wall. Example: purple carrots. Yep. Seriously. I was at the grocery and saw them, they still had the tops on them and everything. They weren’t big, maybe as big around as my finger and 6-8″ long. Hmmm, ok, what the heck, right? I try to eat the rainbow as often as I can. I was kind of afraid, to be honest. I mean what if they tasted like horseradish? Don’t get me wrong, I enjoy horseradish, on roast or prime rib. But to take a big bite of a hunk of horseradish? Um, no. I like my nose just the way it is, thank you very much. I’ll try most things, except beets. And brussels sprouts. And I suppose that makes me a, well, a vegetable-ist. I do discriminate against certain veggies, I’m sorry to say. Don’t hate me for it. Last week, I found fresh asparagus for $1.29/lb. That is crazy cheap! Ok, now what can I do? I have a few recipes that use asparagus, and we had some steamed recently. Oooh! I know, I’ll make a quiche for hubby. He loves the veggies too, and it’s been quite a while since I’ve made a quiche, so it’ll be a nice treat for us on the weekend. Holy cow! It was incredible! I just kind of threw it together and crossed my fingers. I am convinced it was the crossed fingers that made it the BEST EVER! So next time you make a quiche, don’t forget that step, the crossing of the fingers. 1. Preheat oven to 375. Unroll pie crust in greased 9″ pie plate and set aside. 2. In a skillet, saute peppers, onions & garlic (pressed w/garlic press) until crisp tender. Set aside & allow to cool. 3. Wash &** trim woody ends off of asparagus. In a large lidded skillet/sauce pan, steam asparagus in 1/2 to 1″ of water, for 2 to 3 min, or until crisp tender. Remove from heat & allow to cool. Cut into 1″ pieces. 4. In a mixing bowl, beat eggs & milk. Add in cheese, salt, mushrooms, veggies after cooling to the point they’re just warm to the touch. If you put them in and they’re still hot, they’ll start to cook the eggs (you don’t want that). 5. Pour all of this into the prepared pie dish, place in the preheated oven for 40 to 45 min, or until eggs are set in the center. Allow to cool 5 min-ish, slice and serve, and take all the compliments headed your way! 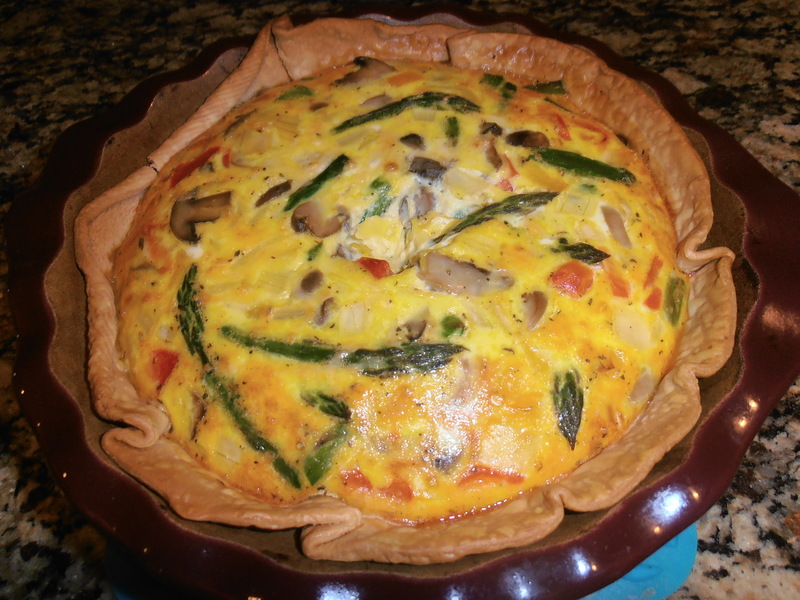 If you are using an 8″ pie plate, you could probably cut the number of eggs down. I started with 4 eggs and because of all the veggies I had in it, I added a couple more eggs. 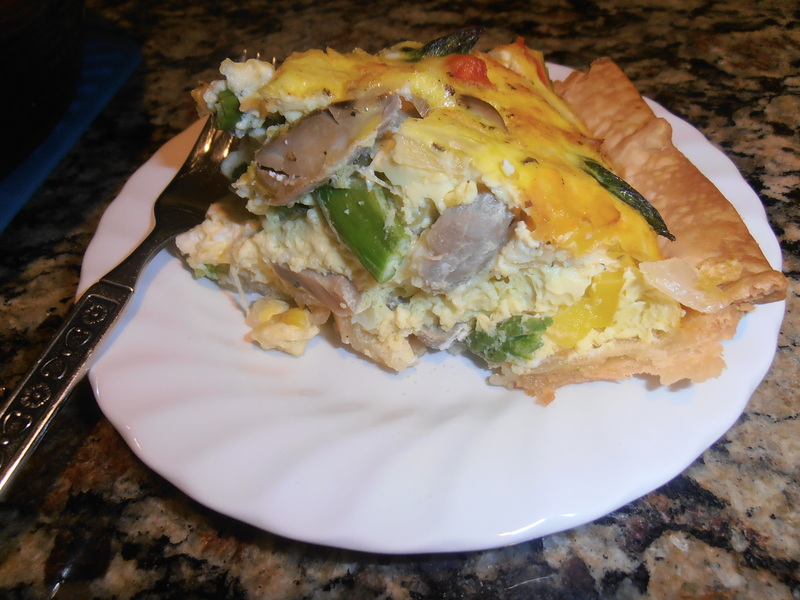 I wanted it to be quiche, not just a little bit of egg w/alot of veggies. Also, if you don’t have red/yellow peppers (b/c they’re normally pretty darn expensive) green would be just fine. If you shred your own cheese, rather than taking the easy way out like I did, you could just add 1 tsp of Italian seasoning and get the same effect. I know, sounds kinda strange, but shouldn’t sound too off, I mean how many people do you know who squeeze lemon on their fish? This is kind of like that, but came from my desire to change my eating habits this year and shake off some of these extra lbs that have managed to find me again. I mean I lost them once, a long time ago, I have no idea how the little buggers found me again! Part of my changes will be making swaps. Swapping foods that are high in fat and/or calories for something that is better for me, but still tastes good. I know, it may not be possible all the way around, but I”m going to give it my best! Any time you can swap out mayo for a healthier alternative, I”m all for it. Mix all together in a bowl and eat with salad, whole wheat crackers, or on a 100 calorie thin sandwich bun for a healthy protein packed lunch. Calories: 1 can tuna 5 oz = 100 calories + 2 tbsp Greek yogurt 10 calories= 110 calories. Paired with fresh green salad and some baby carrots, and you have a great protein and fiber packed lunch that will get you through most of the afternoon! I know, zucchini and chocolate? Really, it works. This is so good, my kids love it, AND they know it’s got green veggies in it! Don’t believe me? Try it yourself! I love to make this when zucchini is in season. Another way for me to sneak healthy foods into my kids w/o them complaining! And the use of applesauce in place of oil helps keep the calories and fat in check, and reduces the guilt factor when you’re eating this delicious treat. 1. Preheat oven to 350F and grease mini loaf pan. 2. Mix dry ingredients. 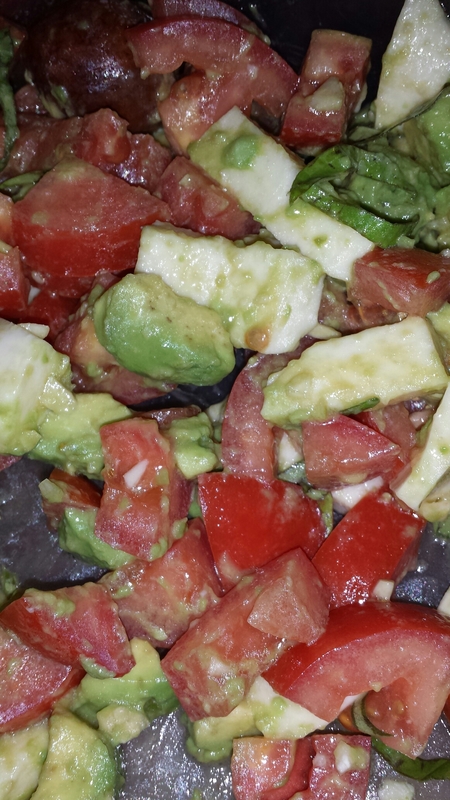 Place all wet ingredients, except zucchini, in a bowl and beat with hand or stand mixer until well blended. 3. Add dry blend to wet mixture. Pause between additions to allow the wet and dry to become well incorporated. 4. Add the zucchini and mix well. Pour into a greased mini loaf pan. Bake 40-45 min or until a toothpick inserted in the center comes out clean. You can peel the zucchini if you want to be sneaky or don’t care to see green in your chocolate bread, but I don’t. Go on, give it a try, you’ll like it, I promise! One more thing I like to do is use a mini muffin pan with this recipe. My kids love the little bite-sized chocolate treats! Over the summer, my slow cooker is my best friend. In cooler weather, it’s my friend too! I’ve got several delicious recipes I like to use it for. Our summer ended rather abruptly this year <NO, I”m not complaining!> so rather than waiting for October to make soups & stews, I get to do it now! One of my husband’s favorites is this one I’m getting ready to share. I got this from my husband’s twin sister. Thanks Kim! I will tell you , I didn’t take any pictures of it, it doesn’t photograph well, but it’s super easy and delicious! It’s warm and hearty, without being really heavy. 2. pour undrained cans of chicken in crockpot. Mix flour and cream/half & half and pour into crock pot. Cook another hour or so. Serve with crusty bread. Delicious and you hardly had to do a thing! If you need to, I think you could totally cook this on low all day, and then add the chicken/cream when you get home from work and give it time to finish cooking. My children grumble and don’t like it, but hey, that’s more for us, right? 😀 Enjoy! I just love this recipe! Amazingly enough, my children, you know the picky, short people who live in my house, the ones who say ‘i don’t like this’ nearly every night, they love this. They even know what’s in it and they can’t get enough of it! My son even used it for a project in 2nd grade. they had to make a recipe and write it out step by step to share w/the class (the recipe, not the food). I was surprised he wanted to do it, but hey, who am I to discourage him from baking something healthy?? 2. mix dry ingredients and set aside. 3. using a hand or stand mixer, blend eggs, applesauce, vanilla and sugar. 4. while running mixer, slowly add in dry flour mixture, pausing after each addition to allow the liquid to be absorbed by the flour. 5. add the zucchini and blend well. 6. pour batter in two greased loaf pans or 4 mini loaf pans (my favorite). 7. bake 40 to 45 min, or until a toothpick inserted in the middle comes out clean. 8. cool in pan for 10 min, then turn onto cooling rack to cool. A couple of options: I used Sun Crystals with this recipe once, I mixed half sugar and half Sun crystals which were a sugar/stevia blend. It’s no longer on the market :(, but I think you could probably do half stevia and half sugar if you want to cut some of the calories and sugars. This bread can also be frozen. Wrap tightly with plastic wrap and place in freezer bag removing as much air from the bag as possible. Can be frozen up to 3 months. Thaw on counter before removing plastic wrap. Yum! Did you know that when you walk 11,000 steps in a day, your feet get really tired? Ha! neither did I, until today! I have been working a book fair at my children’s school and it involves a lot of walking and being on my feet. I broke out the pedometer yesterday, just for grins and giggles. Yesterday I hit over 9,000. Not too bad. Considering a couple of weeks ago, my daily total was probably about 50! Well, maybe a little more than that, but not much. Wanna know something else? 11,000+ steps equates to over 7 miles. That will help burn off those extra lbs I packed on in my fervor to add extra insulation for our unusually cold winter (that lasted all of two weeks)! Or maybe it was my ardent love of baking. Hm. Either way, means my jeans don’t fit me properly after. But, today, they did fit better. Not as well as I’d like, but better, and I’ll take that! And, you’ll be soooo happy to hear, I’ve been able to maintain 1400 to 1500 calories a day and I think my body’s getting used to it. Here’s why I’m thinking that. I don’t feel like I want to chew the finish off the table…all the time! Oh, and I got on the scale today and I think I”m down 3lbs. Eat less, move more is working for me! I do have another tool that’s helping me remain honest. A food log. I write down everything I eat. What’s better, I’m doing it online on www.everydayhealth.com. It’s free and I enter everything that I eat and it tracks the calories. Then I enter the exercise I’ve done, including things like grocery shopping and showering, because they do burn calories. Then I get a total at the end of the day, whether I”m over or under on my calories. It’s pretty cool. It tells me how many calories I need to eat to lose, maintain, or gain weight from my present weight. I don’t know many who WANT to gain weight, but it’s there. Here’s to this being not just a ‘diet’, but a lifestyle change. To be more conscious of what I’m eating and what I”m doing all the time, and teaching my children how to eat better as well. And the upside, I plan on rocking my shorts this summer! And who knows, I may even brave a bikini, but let’s not go shopping just yet!